You are doing really well, just hope you can get the MPEG2 issue fixed soon. How stable has it been running for anyone that has downloaded/installed it, and on which MorphOS supported hardware? I gave it a quick initial test with Curse of Monkey Island, and it seems to work fine, as far as I've played it (again). I tried Space Quest 6: The Spinal Frontier which is one of the latest games v2.0.0 supports, and it seems to work OK, so far, but I haven't dug out any of my other Classic games, such as Riven, and Leisure Suit Larry 6 & 7 that this version supports, but I intend to, once I manage to find them. Great Kudos to you BeWorld. i test Riven, it's working. Lighouse: The Dark Being, works! Screengrab here. Tested also save/load/fullscreen mode, all good! I also have phantasmagoria I & II, Grabiel Knight: The Beast Within in original CDs but I am out of space on my HDs :( Can anybody report if these are working as well? Thanks a lot beworld for your hard and really fast job! Many many thx for your work beworld! It's great to have this new ScummVM version with all those big updates in it! 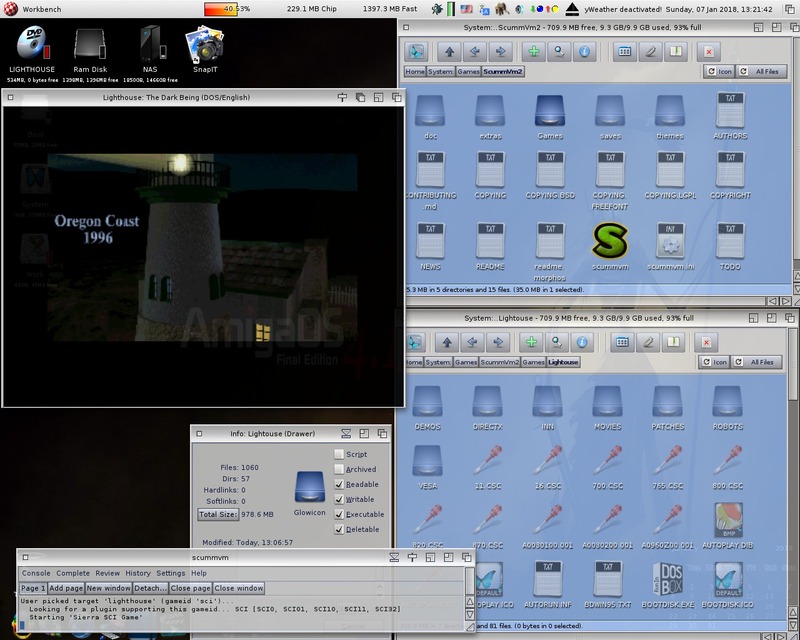 1) If ScummVM is compiled with zlib support, and it can find the DXA file for the cutscene, it will play that. 2) Otherwise, if ScummVM is compiled with MPEG2 support, and it can find the MPEG file for the cutscene, it will play that. 3) Otherwise, it will try to play just the voice-over and, optionally, subtitles of the cutscene. Do you have libMPEG2 ? or somebody. i need to test these libraries if they work well. encode and decode examples work fine. Wow, great to hear! Thanks! After 1h30 to compile Scummvm, finaly it's working well. beworld for president! Much appreciated your hard work pal! Just tested Zork the Grand Inquisitor - works fine so far. Hey BeWorld, I wonder why your Ports are not working with PowerSDL 16.1 ? I always get the error that v15 is needed? Testet with ScummVM, MiniSlug and Chromium. ScummVM was compiled with PowerSDL 16.1. I test on clean install MorphOS 3.10 and PowerSDL 16.1 installed. You have an problem with your install. Hm, what could this be, I just installed PowerSDL 16.1 and still get this message. I have no idea. check/search if you have different powersdl.libray in your system. Enjoying this nice port very much on my G5/G4! Is there any way to suppress this window opening? Someone knows how to remove the "printf" in an executable except to put in comment?